Dursley Stott Spring Handicap Races were held on the NSC Roadway on Thursday 19th March 2015. The Dursley Stott Spring Handicap Races, organised by the Isle of Man Veteran Athletes’ Club, were held on the NSC perimeter roadway on Thursday 19 March in ideal conditions. The 5K walk produced some very fine performances. Fastest on the night was Dale Farquhar in 26mins 22secs but it was Jayne Farquhar who claimed the race victory in an excellent time of 32:27. Fastest lady was Louise Smith in 31:52. 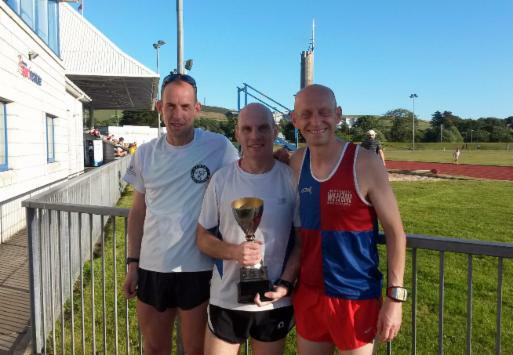 In the 10K run it was Kevin Deakes who took the spoils in a time of 37:24 with another excellent run following his success in the 20 mile race held earlier in the month. However, the fastest time was set by Jamie Newton in 34:07 finishing just 8 seconds ahead of Mike Garrett after a close battle between the pair from start to finish. Mike Garrett’s time of 34:15 is believed to be a new V45 record – yet to be ratified.The fastest lady was Rachael Hamilton in 38:28. Thanks to the lap-counters, marshals, judges, time-keeper and all who helped in this ever increasingly popular race event. Please note that the Form has 2 pages. To be considered a Veteran you must be over 35 years of age and provide proof of age. Please renew your Membership as soon as possible. This photo shows the retiring Chairman (Colin Watterson) with the Club President (Dursley Stott). Between them, Colin and Dursley have served the club for over 50 years. Colin as Chairman for over 32 years and Dursley is in his 24th year as President. Both Gentlemen have a wealth of athletic experience and knowledge and continue to support the club wherever and whenever they can. They are truly inspirational! Colin Watterson gave his final Chairman’s Report as after more than 32 years he has stood down. As usual, his report was very informative giving details of all the 2014 club events. A copy of his report will be published on the website shortly. 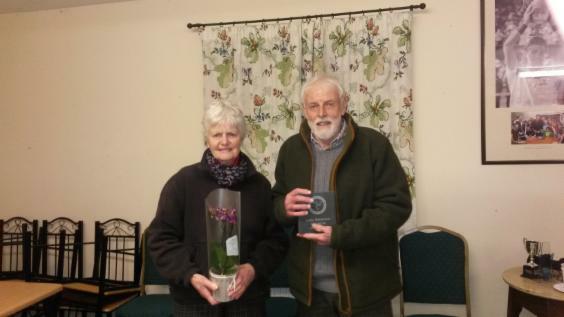 The new Chairman, Terry Bates, presented Colin with a slate memorial for his mantelpiece and Brenda with flowers in recognition of her support to Colin. 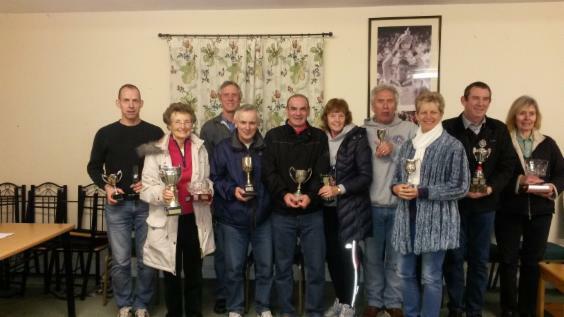 Photo of some of the Trophy Winners - Left to right: Kevin Deakes, Angela Corkish, Terry Bates, Ian Callister, Roger Moughtin, Moira Hall, Geoff Hall, Mandine Wilson, Brian Kelly and Enid Watson. 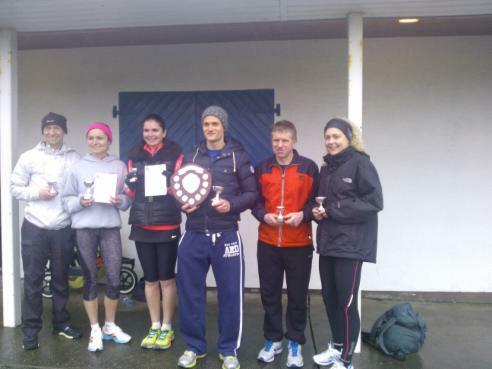 Terry also announced that the 2015 London Marathon club places have been awarded to Maggie Watkins and Rita Norrey. Good luck to both of them. Well done to all. Many thanks to officials, marshals & helpers. held on Thursday 16th October. Sponsored by Dursley Stott OBE. Results --> Run HERE <-- --> Walk HERE <-- Well done to all. Thanks to the officials and helpers on a warm but wet evening. Well done to all taking part in the rather tough conditions. Many thanks to the sponsors, organisers, officials and marshals etc. 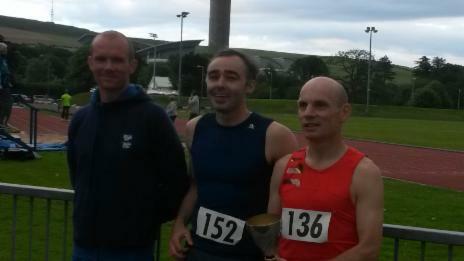 The top three, pictured (L to R) above, Kevin Deakes (3rd) & Mike Garrett (1st) with Nigel Armstrong (2nd). roadway. The race began in ideal weather conditions, with 15 runners on the start line. This race provides the opportunity for runners to check their preparations for the London Marathon. The lapcounters-Sue Ackroyd,Mo Kelly,Jill Wild, and Terry Bates. Marshals-Brian Kelly-Dave Laurie-Arnie Jacobs-Geof Hall and Les Brown. and Manx Harriers for the use of their club house. At the AGM in January, Colin was persuaded to continue as Chairman for a further year. We are all indebted to Colin. His enthusiasm, knowledge and experience of athletics makes him a treasure, not only to our club but to the whole sporting community on the island. Rita Norrey 5:05:44 and Mike Norrey 5:11:41. Paul Curphey 3:19:28, Mark Peberdy 3:38:00, Lesley Christian 4:48:15 and Alison Corlett 5:03:40. Here -- some of the recipients are pictured above, with Dursley Stott (Club President) after our recent AGM. Mike Garrett flying on the first lap, in second place, at Ballabeg corner. By the last lap, at the same spot into the stiff breeze, he had moved up to a winning position with a 10metre lead over Lloyd Taggart. Walk HERE Run HERE Thanks to Marie & Paul Jackson, all officials & helpers. RUNNING GROUP: A friendly informal running group meet every Monday and Wednesday at 6pm in Douglas. 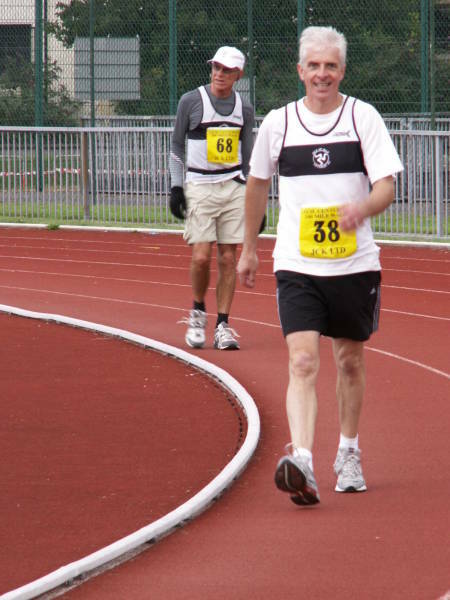 All abilities are welcome and catered for, ranging from complete beginners through to runners training for marathons. You do not need to enrol or belong to an athletic club. Everybody very welcome. Further information from Rob Gillanders on 499775 or Mo Kelly on 834117. Lisa Motley can provide sports massages at very reasonable rates – interested members can get in touch with her on 431651. Any members who wish to claim a record, must complete a form found on the IOM AA website. Once completed the form should be forwarded to Bernie Shimell for ratification. Instructions & further details can be found on the IOM AA website. Results (thanks to Murray Lambden): Walk here and Run here. 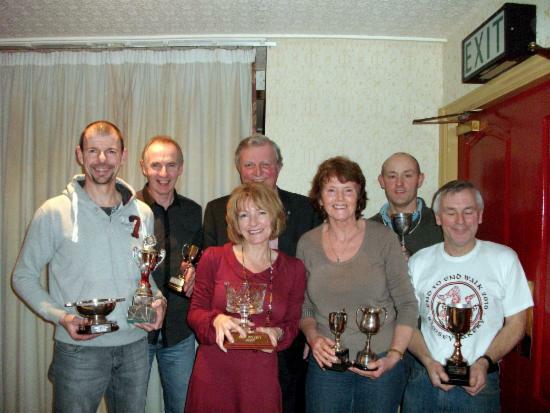 Pictured above by Murray Lambden are Mike Garrett (centre) from Haldane Fisher (IoM) presenting trophies to the overall winners in the mens & ladies running race: Lloyd Taggart and Gail Griffiths. Well done to all. Many thanks to all officials & helpers. Jock, pictured by Adrian Cowin, on the Howe Road above Port St Mary and walking well all the way up to Cregneash before the final stretch down to a fast finish at The Sound in 6:37:29. Pictured above are the IOMVAC & WAC members who travelled to York to take part in the 'Brass Monkey' Half Marathon on Sunday 24th January 2010. Back Row: Barry Moore, Geoff Hall. Middle Row: Moira Hall, Lesley Christian, Rob Gillanders. Front Row: Sue Ackroyd, Vera Jones, Jackie Moore, Claire Hulme, Ingrid Sugden. 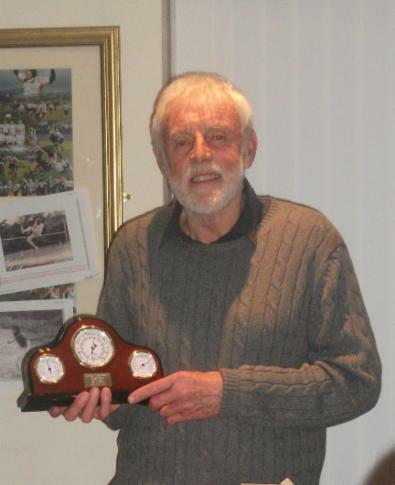 Road Running Shield: 1st Richard Radcliffe. 2nd Rob Sellors. 3rd Stephen Brown. Race Walking League: Men -- 1st Michael George. 2nd Ian Callister. 3rd Jock Waddington. RWL: Women -- 1st Margy Killey. 2nd Lisa Motley. 3rd Bethany Clague. Men -- Vinny Lynch. Ladies -- Margy Killey. Men -- Barry Moore. Ladies -- Moira Hall. Track & Field awards: Men -- Geoff Hall. Ladies -- Moira Hall. Men -- Robbie Callister. Ladies -- Wendy Ross. Fell Runner of the Year (2007): Andy Gosnell. Brian Doughty trophy (services to the club): Christine Bathgate. The photo shows our Chairman, Colin Watterson, presenting Sarah Goldsmith with the Brian Doughty Memorial Trophy which is presented annually for services to the club. The recipient is decided after a secret vote by the Committee. Sarah Goldsmith, a former committee member, earned the award after all her hard work compiling and issuing the newsletter and for her assistance in marshalling numerous events. Pictured above by Stan Hall: Peter Cooper, Dave Corrin & the late James Coulson on top of Greeba summit in December 2001. Well done again Jock! Winner of the CMI Parish Walk 2009. Peter Cooper, Peter Hughes, Simon Cox & Steve Moynihan. 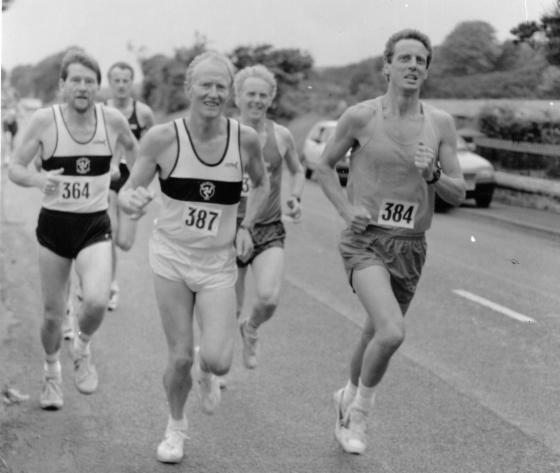 Photograph sent in by Peter Cooper is of the Peel to Castletown Road Race 1994. Left to right: - Club members - Peter Cooper, Brian Goldsmith, Martin Bell, Alan Postlethwaite & Terry Bates. Bethany Clague won the 'Local Hero' category of the Isle of Man Newspapers / Flybe 'Pride in Mann' campaign. 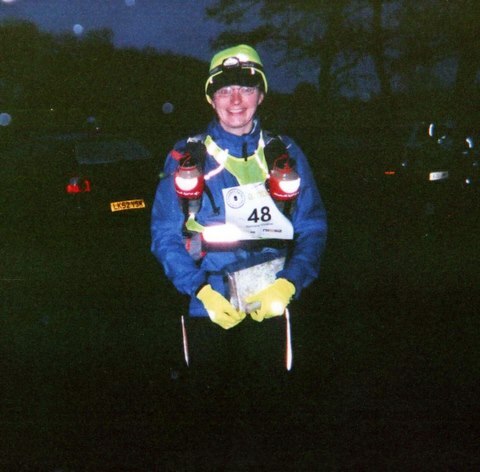 She was nominated by fellow club member, & fellow 'ultra' athlete, Gareth Evans. Well done! 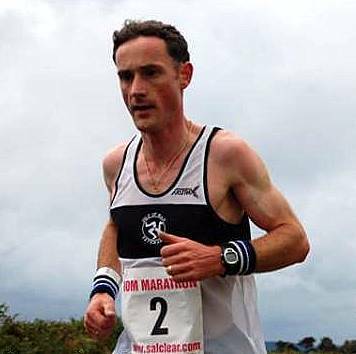 Dublin Marathon 2007: Club member Rob Sellors had a good run in this event on the 29th Oct., & got a new PB of 3hrs13mins despite being wrongly placed in "the rear slow, fun runners / walkers starting pen". IOMVAC member, & Head Teacher of Cronk-y-Berry School, Rob Sellors completed his own version of an ultra-marathon event on Sunday 30th Sept. It was a duathlon of about 91 miles, visiting 41 schools across the Island, & it was covered in around 10.7 hours. He raised £1800 for Manx Cancer Help. A brilliant effort. Read more here. We had a team, see picture below, in the Viking Longboat Boat Races in Peel, on Saturday 4th August. The VIKING VETS were sponsored by Manx Print Care. This team was in the mixed races (5 men & 5 women), rowing in the afternoon and appreciated some support from people on the quayside. The team T-shirts were bright Kelly Green with yellow writing -- you couldn’t miss them! They did very well, beating several other teams. Our team members were Geoff and Moira Hall, Dave and Lynn Quine, Arnie Jacobs, Ingrid Sugden, Les Brown, Rob Gallanders, Mo Kelly and Sue Ackroyd. Ingrid Sugden,Lynne Quine,David Quine,Geoff Hall. Marathon / Half Marathon Sunday 13th August 2006. The top two in the marathon pictured about 10mins after the start (pic. Adrian Cowin). More photos., info. and links on our Marathon page: please click here. RESULTS: Please click on the following -- Marathon or Half Marathon. Picture by Paul Jackson. For more shots & the results please click here, also see manxathletics.com and pictures by Murray Lambden here. Event Stopped at about 10miles from normal finish due to hill fog. 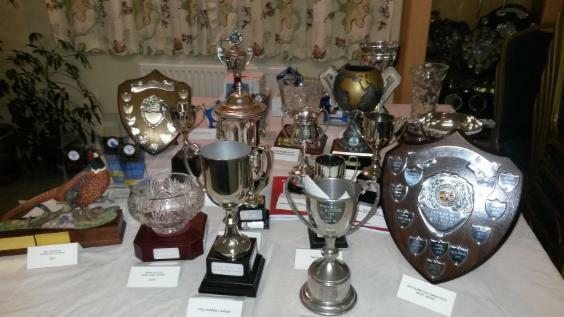 Please see pages at www.manxathletics.com for more, including photos. Thanks to Murray Lambden. Club member Gareth Evans did well at the Thames Path 50 mile Ultra on Saturday 17th Feb., he finished 43rd out of 123 starters (there were 161 entries) in a time of 9:32:15. See the full results here. 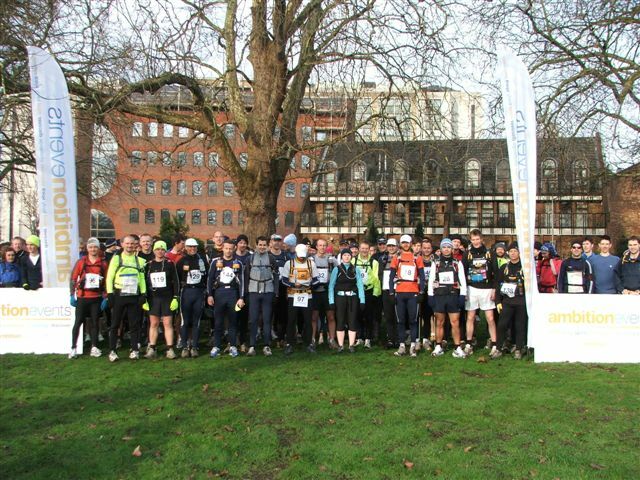 The course finished in Shepperton & started in Reading -- see picture below, I think Gareth may be in the middle of the front row (wearing the yellow top with '..9' visible, his race number was 39). Members & guests at our Club Annual Presentation Dinner 2006, pictures by Simon Cox. To see other shots from that night please click here. Syd Quirk Half Marathon Run & Walk was held on Sunday 5th November 2006. To see the great coverage, results etc. for the 'Syd Quirk' please click here. Thanks to Murray Lambden (manxathletics.com). Thanks to Dave Nixon. Held on Thursday 22nd March at NSC. RUN click here (pdf) or here (Excel). WALK click here (pdf) or here (Excel).